4 bedrooms, sleeps 10, 3 full bathrooms, modern kitchen fully equipped, dining room, living room, parlor, sitting room and sun room. 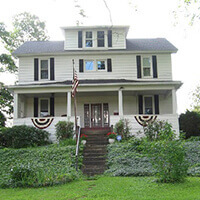 Large front porch, Wi-Fi, Direct TV, DVD players and cell phone coverage. All linens are provided.